Before registration please read all the important information in this page. Upon receipt of the registration form and the payment, a Letter of Confirmation will be sent to the participants. Please present the Letter of Confirmation at the Registration desk at the Conference venue to pick up your Conference Kit. Early registration fees will only be confirmed if the registration form and the payment are received by 12 May 2017 at the latest. Details about methods of payment are available here. Regular Registration fee covers the full paper submission of the contribution. Both oral and poster contributors will have the possibility to submit a full paper for publication in internationally recognised peer-reviewed journals indexed in the main indexing & abstracting services such as Scopus. Click here for more information. Student fees are applicable only to full-time students. 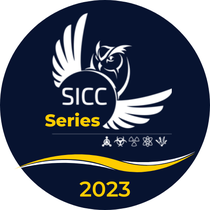 Students must send a proof of their student status (student ID or certificate) to sicc2017@sicc2017.com, certified by the signature of a supervisor, as a PDF file. Student registration will be validated upon receipt of the proof. Student Registration fee covers the full paper submission of the contribution. Both oral and poster contributors will have the possibility to submit a full paper for publication in internationally recognised peer-reviewed journals indexed in the main indexing & abstracting services such as Scopus. Click here for more information.